Category Archives for "Tattoo Removal"
Tattoos are considered by many as works of art. An expression of who you are and an extension of your personality. Often referred to as body art, it’s a popular option to boost your sense of style. That is of course, unless you change your mind. The trouble with tattoos is they are designed to be permanent. There are many different reasons to have a tattoo removed. Perhaps it was an impulse decision you’ve come to regret. Maybe the workmanship was substandard and you are not happy with the results. Possibly, the name of the special someone you had forever etched to your skin, is no longer in the picture. Whatever your reason, the good news is, there are a few different methods to have your tattoo removed. Many clinics use lasers to penetrate the tattoo and break up the ink. This will take several sessions for complete removal so is by far the quickest method. It’s popular and effective for complete tattoo removal. Some practitioners actually sand off the tattoo. Dermabrasion is sometimes used to file off each layer of skin until the tattoo is gone. This takes several treatments to get through the inked layers, and aside from being painful, can sometimes damage and scar the remaining tissue! In some cases, the entire tattoo is removed by surgical procedure. This is a costly method and often involves skin grafts. Recovery time for the excision to heal can sometimes be prolonged, and as with any surgical procedure, there is a risk of infection or other complications. Depending on the location of the tattoo, it may be difficult to care for the area after the tattoo has been removed. Finally, chemical peels such as TCA have been used with some success in tattoo removal. Several sessions are usually needed as each layer of skin is peeled away until the entire tattoo has been removed. This method is widely available in spas, although some doctors may also offer it. If permanent removal of your tattoos isn’t feasible due to monetary restrictions or health concerns, there are several lotions and creams on the market that can reduce the look of your tattoo. Lightening products will reduce the depth of the colours. However, this is a very lengthy process that will most likely take years and there is no guarantee of success. Most users will give up long before their tattoo is removed. 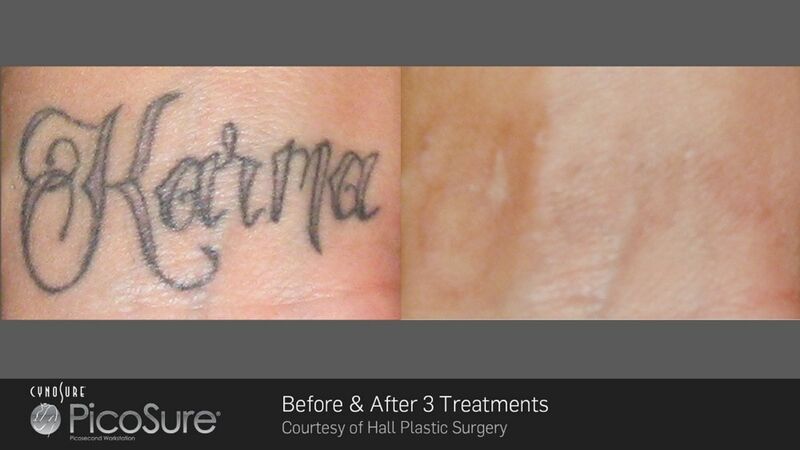 Discover more about our PicoSure laser tattoo removal service.